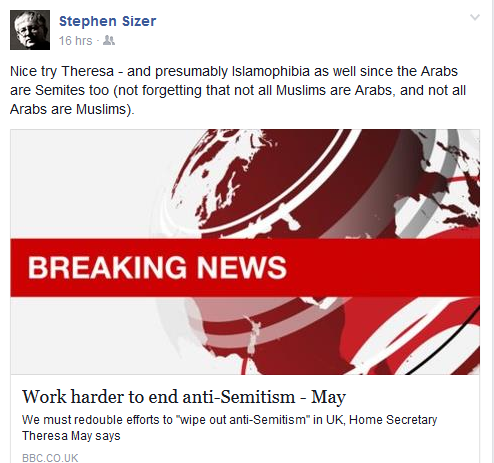 Stephen Sizer: “Encouraging research and debate on all aspects of [9/11] is not anti-Semitic"
The London Jewish News is a popular and deserving competitor to Anglo-Jewry's supposed newspaper of record, the Jewish Chronicle. 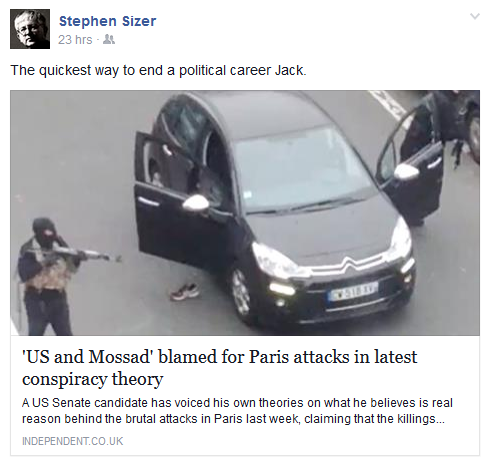 It carries a report regarding Stephen Sizer's despicable action in linking to a grossly antisemitic article that laid the blame for 9/11 on Israel and a number of named Jews (I posted about this here). The report, out today, tells that, following overtures from Mr Jonathan Arkush, vice-president of the British Board of Deputies, Sizer has removed that link. Posted on 20 January (as shown at right) the link to the article (see my above-mentioned post for that) remained on Facebook for over a week, attracting a total of 60 comments, many of them antisemitic, and at least two "shares". 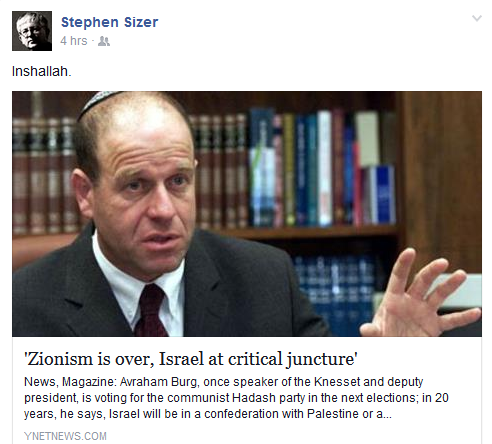 Disturbingly, not one of Sizer's followers suggested to him in those comments that the post should be taken down. 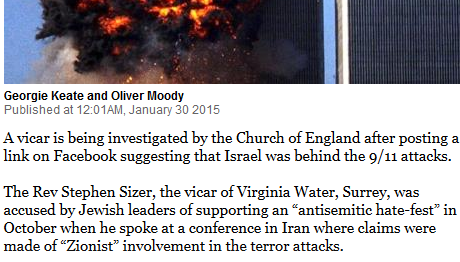 “Posting, and giving approval to, an article which in effect accuses Jews of responsibility for the 9/11 atrocity is unquestionably anti-Semitic, just as it is beyond absurd...."
And there's a big article about this unsavoury post of Sizer's in the London Evening Standard that shows the diocese of Guildford is finally on the case! 'The Bishop of Dorking, the Right Revd Ian Brackley, said the Diocese of Guildford, which includes Dr Sizer’s Virginia Water parish, is urgently investigating. “I want to reassure everyone that we are taking this complaint extremely seriously,” he said. A spokesman for the Church of England added: “These comments would rightly be seen as unacceptable whenever they were posted. “It is a matter of deep sorrow and shame that they have been posted in this week of all weeks. He added: “I think they are trying to discredit me – they have tried several times to do that and they have seized on one little link to an article. Yorkshire-born Anglo-Jewish actress, writer, and humorist Maureen Lipman, an outspoken champion of Israel, was born the year following the end of the Second World War (although for reasons better known to itself the Daily Mail gives her age as 71). Like her contemporaries, the woman often described as a "British National Treasure" grew up during a time when antisemitism appeared to have virtually expired, as people contemplated the unparallelled genocidal wickedness to which antisemitism led. 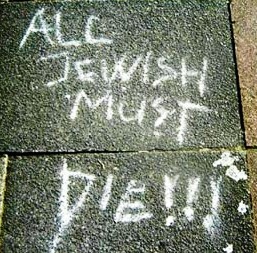 Today, of course, antisemitism has proved, both in Britain and other parts of Europe, that it was not at death's door but only slumbering after all, and none too deeply at that. When the economy dries up, then they turn on the usual scapegoat: the usual suspect – the Jew. Stephen Spielberg, too, spoke out on Holocaust Memorial Day on burgeoning antisemitism. Obama Spokesman On Avoiding The Term "Radical Islam"
".... Today we bow our heads in memory of the victims in Paris. However, as representatives of an ancient and proud people, we stand tall against evil because we can overcome it. "The more they were oppressed, the more they multiplied and spread" – because truth and justice are on our side. And here is the truth: Our shared enemy is Radical Islam, not Islam and not just radicals – Radical Islam. This form of Islam has many names: ISIS, Hamas, Boko Haram, al-Qaeda, al-Nusra, al-Shabab, Hezbollah; but they are all branches from the same poison tree. For this reason it is not a coincidence that Radical Islam has sought to destroy Israel from the very day it declared its independence: Because Israel is the only Western democracy in the Middle East, because Israel is the only place that is truly safe for Christians, women, minorities, that respects all human rights. Well, here is another truth: Radical Islam does not hate the West because of Israel. 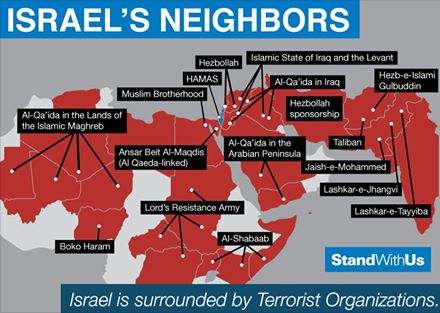 It hates Israel because it is an organic part of the West. It rightly views Israel as an island of Western democracy and tolerance in an ocean of fanaticism and violence that it wishes to impose on the Middle East, Europe and the entire world. Israel is not under attack because of this or that detail of its policies, but rather because of its very existence and nature. But we are not the only ones under attack. Look around you: The entire world is under attack, the entire world – the Twin Towers in New York, the subways in London and Madrid, tourists in Bali, students at schools in Russia and Pakistan, a hotel in Mumbai, the mall in Nairobi." 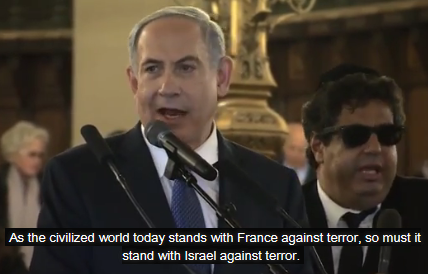 So said Bibi Netanyahu during his stirring speech at the Grand Synagogue, Paris, following the .Charlie Hebdo and Hyper Cacher killing spree. 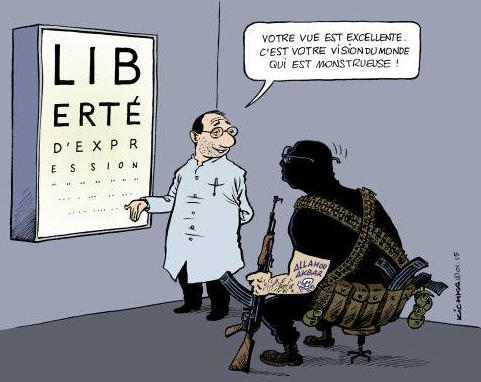 'The head of BBC Arabic has instructed editors not to use the word "terrorist" to describe the Islamist gunmen who murdered 12 people at the Paris offices of the Charlie Hebdo satirical magazine. Tarik Kafala told the UK's Independent newspaper that the term "terrorist" is too "loaded," and said the decision was in-line with the BBC's overall policy on reporting such attacks. 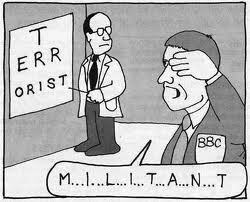 "We try to avoid describing anyone as a terrorist or an act as being terrorist. What we try to do is to say that 'two men killed 12 people in an attack on the office of a satirical magazine'. 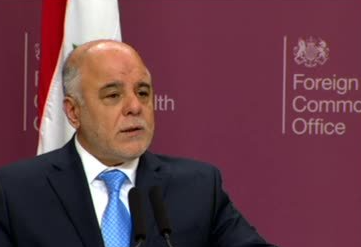 That’s enough, we know what that means and what it is," said Kafala. 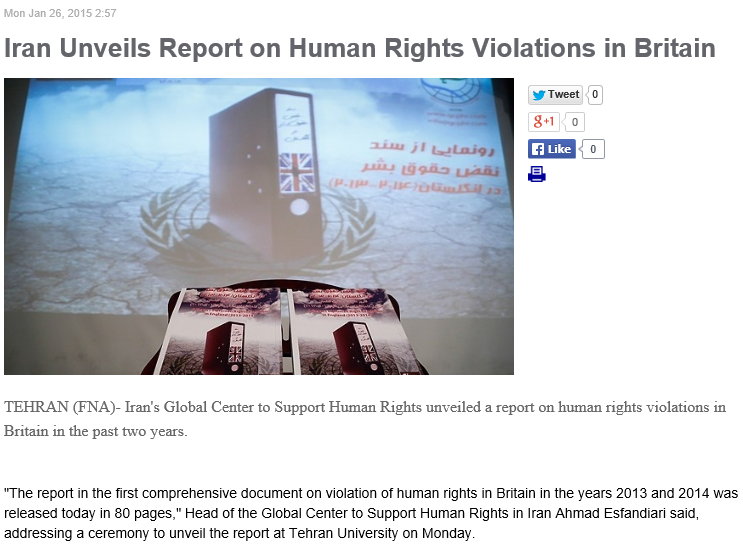 The Farsi News Agency reports today that Iran has published a report on human rights violations during 2013 and 2014. Let's give credit where it's due: this is a most noble and long overdue gesture on the part of a country in which human rights violations are frequent and monstrous. A country that punishes homosexuals with the noose and is not averse to hanging women, stones women for adultery, persecutes apostates, dissidents, and members of religious minorities even to the death. A country that has now bitten the bullet and exposed such horrific and unconscionable occurrences. “And all the coalition partners are continuing to make vital contributions .., and we mean all 60. Whether it’s sheltering refugees, training, advising Iraqi troops on the front lines, or speaking out against Daesh’s [Islamic State – Ed.] hateful, false ideology, we appreciate the contribution of every single member, each of whom has chosen one line of effort or another. One can only ask: why then are these 133 reluctant States not members of the American-led coalition? Are they prepared to let the other 60 States do the heavy lifting for them whilst they just sit by and watch? 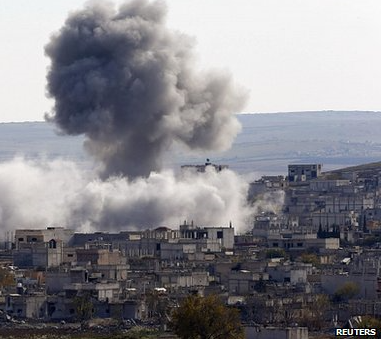 Will they only be motivated to join the American-led coalition when Islamic State comes knocking at their door? 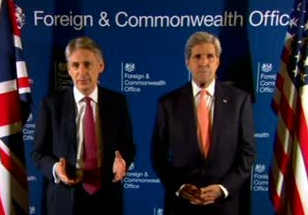 Pointedly, the Joint Press Availability with UK Foreign Secretary Hammond and Iraqi Prime Minister Abadi – issued by the US State Department following the London Conference – made no mention of any discussion having taken place at the Conference concerning Yemen’s dramatic cave-in this week – resulting in the resignation of Yemeni President Abed Rabbo Mansour Hadi after having being held captive following a concerted assault waged by Houthi rebels. Yemen had been allowing the United States to wage counter-terror drone strike operations targeting Al Qaeda in the Arabian Peninsula from Yemen’s sovereign territory. Membership of Al-Qaeda and Islamic State was respectively claimed by the perpetrators of two horrific massacres in Paris last week at the offices of publisher Charlie Hebdo and a Kosher supermarket – resulting in the murder of seventeen people whilst putting France on a state of highest alert to counter any further possible terrorist attacks in their wake. The events in Yemen represent a spectacular collapse of President Obama’s policy for similarly countering Islamic State in Iraq – by training supplying and using Iraqi forces to fight Islamic State on the ground whilst the coalition counters Islamic State from the air. Could Yemen’s fate herald the Iraqi Government’s possible collapse? How long will it take Obama to understand that Islamic State can only be comprehensively defeated by military action undertaken on the ground by a properly equipped and authorised United Nations international force? The Scottish city of Dundee has the distinction of being Gorgeous George's birthplace and cradle, and it was under Gorgeous George's influence that, getting on for 40 years ago, its council chamber became the first in all of (post-)Christendom to fly the Palestinian flag. And not long afterwards the city twinned with Nablus. But to judge from certain of the comments, some people suspect an ulterior motive. Anyway, remember Gorgeous George's bombastic declaration last August that the Yorkshire city of Bradford is and must be an Israel-free zone, sans Israeli goods, sans Israeli academics, sans Israeli tourists, sans Israeli everything? 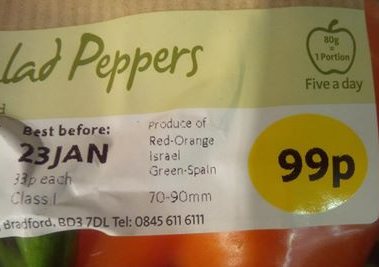 Well, how pleasing to learn on the grapevine (hat tip: reader P) that Israeli peppers are doing a brisk trade in Bradford, as, it seems, elsewhere. And not surprisingly the usual suspects are getting all – well – peppery over it. Morrison's, they're moaning to each other, is (shock, horror) selling Israeli avocados as well! Sainsburys, they're complaining between themselves, is stocking lots of Israeli goods, and so is bargain-price supermarket chain Lidl. "I am tired of turning over the boxes to find out where stuff is from, it should be clearly labelled, I am not popular in my local Waitrose .. but I will not stop"
"Our supermarkets like to con us into buying what they want to sell rather than what we want to buy. Managers know that if it is good for Israel it is good for their career prospects." 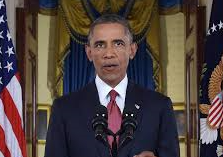 "Those long red peppers nearly always come from Israel and I have plenty Muslim friends who buy them without a care." Many readers will already have seen the video. Hat tip: Leah Kupfer for bringing it to my attention. Many have welcomed with cheers the sudden Israeli strike on Sunday that killed six Hezbollah members and a general in the Iranian Revolutionary Guard Corps who, for some reason, were secretly present in Syria’s Quneitra region. The cheering for this act on social networking platforms is an expression of anger and indignation, and we’ve even sensed these feelings expressed by sympathizers with Islamist groups. This represents a huge change of feelings about Hezbollah, due to its heinous actions in targeting its rivals in Lebanon and its involvement in the killing of thousands in Syria. Many of those who have shifted from admiring Hezbollah to hating the group did so in less than a decade. These people used to support Hezbollah in Lebanon in the past and they used to adopt the Shi’ite group’s political and military agenda. Anger began to surface when Hezbollah’s militias occupied west Beirut during the events of May 7, 2008, three years after the party’s involvement in the assassination of Sunni leader Rafik Hariri. Hezbollah, and also Iran, have lost the respect and status they’ve always enjoyed in the name of Islam, Lebanon and Palestine. Hezbollah’s biggest fall came after its clear sectarian bias in Syria emerged when its members joined the terrible war there, which has killed more than 250,000 people in what is surely the most shameful crime in the history of the region. Iranian involvement in Syria will also have further repercussions. In my opinion there’s no doubt that if a confrontation occurs between Israel and Hezbollah, or between Israel and Iran, many Arabs will pray for the defeat of Hezbollah’s militias and the generals of its Iranian ally. This strange feeling, even if temporary, reflects the change in the region’s alliances and political stances. The hatred held by many Arabs towards Iran and Hezbollah does not necessarily mean they have suddenly developed affection for Israel—that’s another story. Perhaps this would happen in the event of the brokering of a Palestinian–Israeli peace accord that garners more popular acceptance than before. In case a regional struggle happens, like an Arab struggle with Iran, and Israel is an apparent party in the Arab camp, people will, I believe, turn a blind eye to a temporary alliance under the principle of “my enemy’s enemy is my friend.” Once again, this does not mean that Israel will be accepted by Arabs on the popular level—unless there is a peace deal with the Palestinians. We are in a now in a phase where the map and alliances drawn of after 1948 are in transition, and the struggles and hostilities in the region may be shifted in a totally different direction. Iran and Hezbollah may be on the side of the Jewish state if a nuclear agreement is signed with the West that satisfies Israel, which is now considered an obstacle due to its strict stance against American concessions to the Iranians. In case of a US insistence on reaching an agreement with Iran that angers Israel, the latter could realign itself towards Arab countries to achieve the necessary regional balance. Israel is currently participating, from a distance, alongside an alliance that’s publicly pressuring the administration of Barack Obama against offering any concessions in negotiations with Tehran; however, we can’t count on the formation of an Israeli–Gulf alliance because Israeli disputes with the Arabs of the Gulf regarding Palestine and Syria are not only serious and numerous, but will also be difficult to overcome. As always, keep safe, Orim! 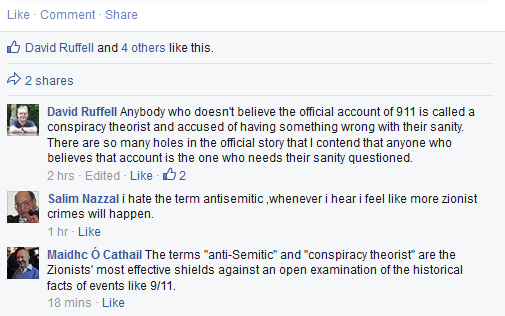 Stephen Sizer re Article Blaming Jews & Israel For 9/11: "Is This Antisemitic?... 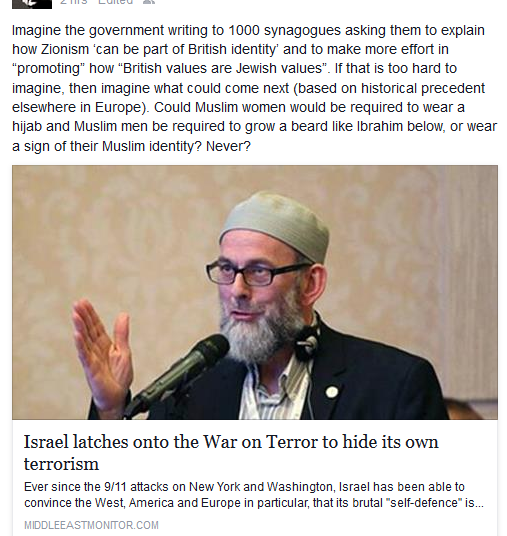 It Raises So Many Questions"
On Facebook, the anti-Israel Anglican vicar of Virginia Water continues to sail close to the wind, as far as antisemitism is concerned. 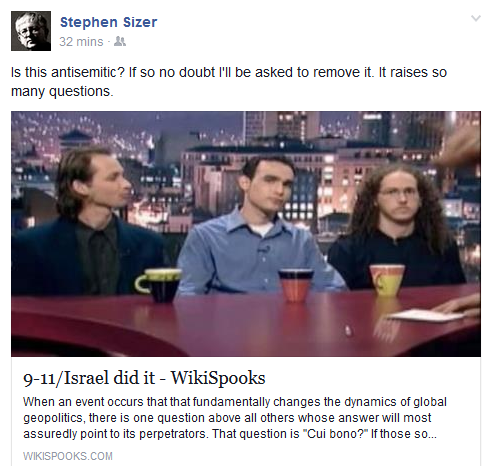 Does Sizer really have to ask? 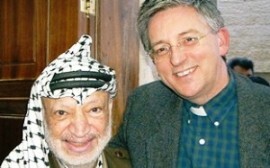 Does this man of the cloth not recognise raw Jew-hatred when he sees it? Apart from that excursion into the dunghill, the vicar continues to post obsessively, as always, about Israel, and in the process sometimes has a little dig at da Joos, but the above link surely marks a particularly low point in the long-running Sizer saga. With it, he has surely reneged on his undertaking to the Board made in 2013. Incidentally, Sizer, who's no stranger to Iran's satellite propaganda channel Press TV, now has a new broadcasting outlet. It's the London-based Iraqi Al Etejah English language TV station. Its Facebook page gives the station's flavour but I don't know who funds the channel (I wish I did). 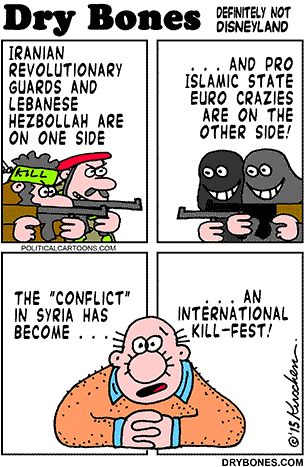 "...It is supported by the Hezbollah Brigades. It has both an Arabic and an English version named "Aletejah TV English" which is being broadcast on multiple European satellites such as Hot Bird." "Kata'ib Hezbollah (KH) or Hezbollah Battalions is a Shi'a Iraqi Insurgent group which has been active since 4 months before the beginning of the Iraq War (although their first attack was on October 2003), not to be confused with the Lebanese militant group Hezbollah. It is said to be an offshoot of the "Special Groups", which are the Iranian backed elements of the Mahdi Army. Katai'b Hezbollah is a separate and independent organization and not part of the Mahdi Army and its Special Groups. According to the American forces it receives funding, training, logistics, and material from Iran's Quds Force, claims which are denied by Iran. Abu Mahdi al-Muhandis, an adviser to Iran's Quds Force is known to be a senior adviser to Kata'ib Hezbollah. The US state department has also claimed Hezbollah provided weapons and training for the group. The group is known for uploading its videos of attacks on American forces on the internet...."
In Summer 2008 US and Iraqi Forces launched a crackdown against Kata'ib Hezbollah (and the Special Groups). At least 30 of its members were captured during those months. Many of the group's leaders were captured and us officials claim that "as result much of the leadership fled to Iran". On 21 July 2010 Iran is supporting three Shiite groups in Iraq that have been attempting to attack US bases, General Ray Odierno said. Kata'ib Hezbollah is one of these groups and the other groups are Asa'ib Ahl al-Haq (League of the Righteous), and the Promised Day Brigades...."
Well did the great communicator make that point in the magnificent speech he made, to rapturous applause, at the Grand Synagogue in Paris. It seems, from his account of the "public event", that reporter Bryan Seymour, who attended on behalf of Channel Seven, was left under no illusion that the organisers welcomed his presence. "Around 200 men and another 50 women and children, behind a curtain at the back [my emphasis, for this was a secular event], attended," he tells us inter alia. 'Australia's democratic government has to go in favour of an Islamic Caliphate ruled by Sharia Law. 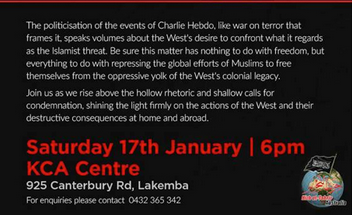 In most of the Middle East, Hizb ut-Tahrir is a proscribed organisation, but not in Australia or the dear old Motherland. Its major conferences (like the one at right) in Australia attract delegates and speakers from abroad. 'The group is proscribed in Germany for anti-Semitism, and Russia declared it a criminal organisation in 1999. 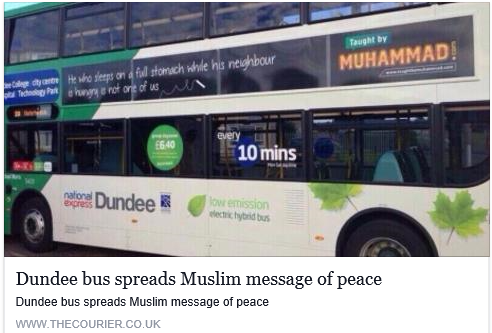 There have been unsuccessful calls to ban the group in Britain and Australia. Wassim Kabbara, 33, said he had come to the conference as a ''litmus test for me … to see what these guys are doing versus what the West is trying to do''. He agreed with themes at the conference that ''Islam and democracy do not come together''. The keynote speaker, Dr Mohammad Jeelani, said the West had decided to ''plant a cancer in the Muslim world'', and that cancer was the state of Israel. Still, it seems from the rest of Bryan Seymour's report that, albeit in fits and starts like the dozy dormouse at the Mad Hatter's Tea Party, the Aussie authorities might be waking up. Read and see more of Channel Seven's report (including a video report) here. And here, entitled "CharlieHebdomania Plunges World Into Whirlpool Of Islamic Violence", is the latest post by Sydney lawyer and international affairs analyst David Singer. The sale of seven million copies of the magazine Charlie Hebdo featuring a front page cartoon depicting an image purporting to be that of Muhammad has brought forth its first bloody response from the Islamic world – Niger – where reportedly three people have been killed and six churches attacked and looted. Riots and protests in Algeria, Somalia, Pakistan and Jordan [see also my previous post - D.A.] 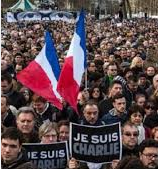 have added fuel to the rapidly growing feeling of resentment and hostility that Charlie Hebdo has inflamed. Niger's President , Mahamadou Issoufou, was one of six African heads of state who attended the unity march in Paris last Sunday in the aftermath of the horrific massacres in the offices of Charlie Hebdo and a Kosher supermarket - that saw 17 people murdered in cold blood by terrorists identifying themselves with Islamic State and Al-Qaeda. 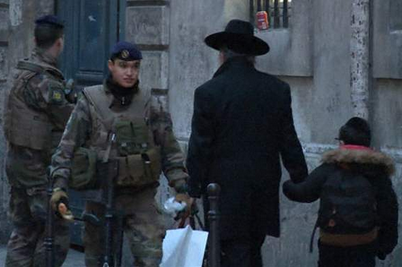 "Those who loot these places of worship, who desecrate them and kill their Christian compatriots... have understood nothing of Islam"
“…France has principles and values, in particular freedom of expression." Shooting civilians in cold blood in their offices and in a supermarket needed to be condemned and swiftly ended. No State can possibly permit such conduct within its borders nor can any such conduct be justified on any grounds whatsoever – no matter who or what is the target. But was cocking your nose an appropriate response to the sensitivities and feelings of 1.4 billion Moslems around the world – 4.7 million of whom were estimated in 2010 by the Pew Report to live in France and comprise 7.5 per cent of France’s population – by publishing another depiction of Muhammad contrary to what many Moslems believe to be the precepts of Islam? "There are tensions abroad where people don't understand our attachment to the freedom of speech. We've seen the protests, and I would say that in France all beliefs are respected." How can Hollande claim that France respects all beliefs when his own prime minister is photographed holding a copy of the front page of the latest Charlie Hebdo magazine leaving the weekly cabinet meeting at the Elysée Palace in Paris? There surely is a big difference in supporting the freedom of expression whilst at the same time disagreeing strenuously with the views those people are expressing. Would the better response have been to leave those seven million copies on the newsstand shelves unsold and its contents condemned for fuelling racial hatred? Hollande’s unity march – led by more than 40 international leaders locking arms in solidarity – should have concentrated solely on calling for the eradication of those responsible for the terrorist attacks – Islamic State and Al-Qaeda – rather than marching ahead of a sea of “Je suis Charlie” banners hoisted defiantly aloft behind them. Collective international military action is undoubtedly needed to degrade and destroy these enemies of humankind engaging in unimaginable acts of violence all around the world and threatening its peace and security – including groups such Boko Haram, Jabhat Al-Nusra, Taliban, Hamas and Hezbollah. The message should be clear and unyielding – no state will tolerate under any circumstances the deliberate targeting of its civilians for any reasons whatsoever. Hollande’s march should have been just the first stage of a world unity march by all world leaders to the United Nations in New York – demanding the passing of a Resolution by the UN Security Council to take military action against Islamic State and Al Qaeda. Until 193 world states identify and eradicate their common enemies, CharlieHebdomania will remain an incurable illness with frightening consequences. 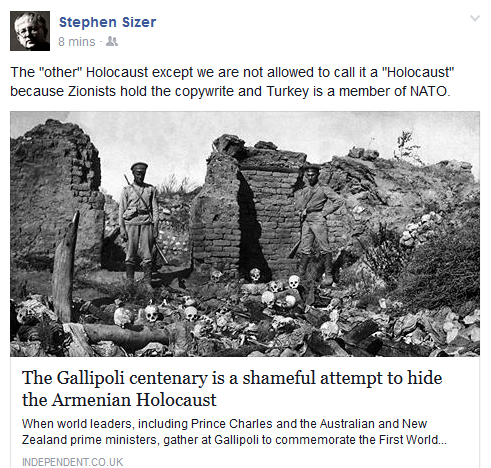 Shame On You, Stephen Sizer! Shame On You!